Sky LLU to BT Infinity 2 Downtime??? After Sky messed up my Sky Fibre order i am coming back to BT. I am currently on Sky's LLU Phoneline and broadband package. Will i have any downtime when i switch over to BT Infinity 2? The BT live chat said NO, but i'd like some real world replies. Any of you done the same and have a seamless transition? Re: Sky LLU to BT Infinity 2 Downtime??? Did the same not long ago, only downtime was when the engineer installed the faceplate in the house and configured the green cabinet total of about 30 mins. Now getting 74 down 9 up. From Sky LLU phone and broadband? That needs neat timing. I woudl expect the FTTC to be connected first, with downtime as you say, then the phone line needs shifting at the exchange. That would give downtime on the phone, but the FTTC should carry on. If the line move at the exchange is done first then both would go down while that was done, and there would be no internet until the FTTC work was done. So perhaps a bit longer than you experienced. i realise i will have downtime on the day of connection. That is not an issue. I've just moved from Sky full LLU (line and broadband) back to a BT Line and Infinity 2. Placed my order on the BT website, was given a date for migration straight away (30/04/12). On day of switch over my phone and BB from Sky went down at 8.10 am in the morning and then the Openreach engineer arrived about 40 minutes later. In the meantime the line came back up with BT and the engineer had fibre connected and up and running within 30 minutes. Job done, great speeds too. I've just moved from Sky LLU (line and broadband) back to a BT Line and Infinity 2. What so migrating from Sky is a lot easier now? 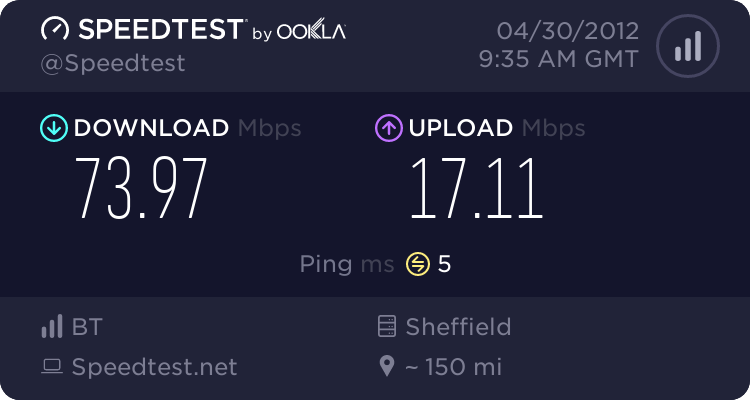 I'm asking because I'm looking for re-assurance, there could be a chance that I may want to migrate back to BT retail as I'm assuming they'll be the first to get fibre on demand (hoping the install costs will be in the hundreds and not in the thousands ). I think I read something somewhere saying that it is easier now to migrate away from LLU providers. I'm thinking of getting either Sky LLU fibre (80/20) or BT Infinity 2 but I've read a lot of people that order Sky 80/20 seem to have a lot of problems actually getting it, it's probably something to do with the ordering system and needs a high up techie or two to sort it. Have I missed or forgotten something? I thought Sky was only 40/2 at the moment, except perhaps for existing triallists? Nope, its available to anyone who meets the following criteria, you can't have sky broadband and phone or FTTC already (any provider) and Sky LLU has to be available in your area well as FTTC (of course). Oh and you have to ring up for it, I assume it's the order system again, it should be all sorted in one (Sky customers will get the option to upgrade and people will be able to order 80/20 online). Thanks. I must have had a brain-fade. I remember reading tbb News Article, now that I've found it using the ISPreview date. The tbb one is the day before .